Today, in post-civil war Liberia, less than 10 per cent of the population has access to electricity. 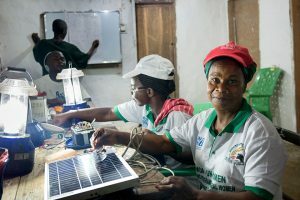 While the country tries to rebuild its infrastructure, women solar engineers are pioneering efforts to provide affordable and clean energy by installing and managing solar lamps in their communities. Rural Liberian women, trained as solar engineers over a six-month period by Barefoot College in India, with support from UN Women, are promoting renewable solar energy that reduces dependency on expensive and polluting fossil fuels, like kerosene. The solar lamps are lighting villages and communities, enabling longer work and study hours, and bringing greater security to many, especially at night time. Infrastructure across Liberia, including electricity installations, was destroyed during the country’s protracted civil war (1989-2003). 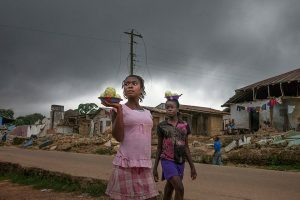 Above, girls in the town of Totota in Bong County walk past homes that are being demolished as the government rebuilds roadways. Totota once had access to the national power grid, but during the civil war, electrical cables were damaged and looted. Now battery-powered lamps are the main source of light for many vendors working after dark. While Liberia works to rebuild its power grid, many communities rely on privately owned generators to access power for their homes. Cables, such as the one above, are connected to a private generator in Peace Island, Monrovia, locally known as “540” because most residents are former soldiers or members of armed groups who were paid $540 to lay down their weapons during a demilitarization campaign after the civil war. Pictured at work in Juah Town, Grand Bassa County, Liberia in 2015, 57-year-old Musu Junius and 49-year-old Marie Weeks, are trained solar engineers who have brought solar panels and lamps to their community. UN Women and Barefoot College in India collaborated on bringing solar electricity to African villages by training rural women to become solar engineers. 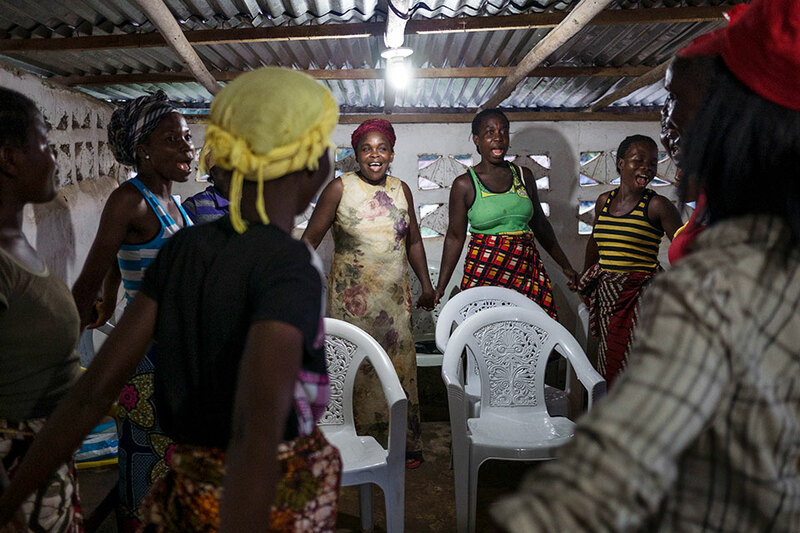 In 2011, 26 women from 16 villages in Liberia, South Sudan, Tanzania, and Uganda were selected to participate in six months of training on building, installing and maintaining solar lamps and panels.